MapFriends and familily can follow you live! LocaToWeb is a GPS tracker app for Iphone, Android and Windows Phone that shares your position to web in real time. Friends and family can follow you live!. LocaToWeb is a live GPS tracker for your mobile phone that uses your phone's built in GPS to get accurate location data such as coordinates, altitude and speed. The app only tracks your position when a new track has been set up and started, and lasts until you stop it. 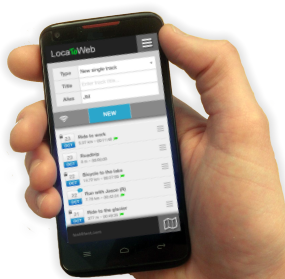 LocaToWeb has an app for the 3 major platforms: IPhone (ios), Android and Windows Phone 8. It is frequently used to track bicycle rides, road trips, hiking trips and other outdoor adventures where you want to show your friends and family where you are. There is also a safety aspect of using this GPS tracker app. If you have the track running and something happens, your wife, husband and friends can see the exact location of where you are. Maybe you are riding your bike and fall off breaking a leg, or you just want to be safe when walking home alone at night. This GPS app will monitor your exact location wherever you go. Many wife's, husbands and parents are more relaxed when their spouse or kids are out cycling, running, hiking, driving or doing outdoor sports, knowing that it's possible to track them live on a map.